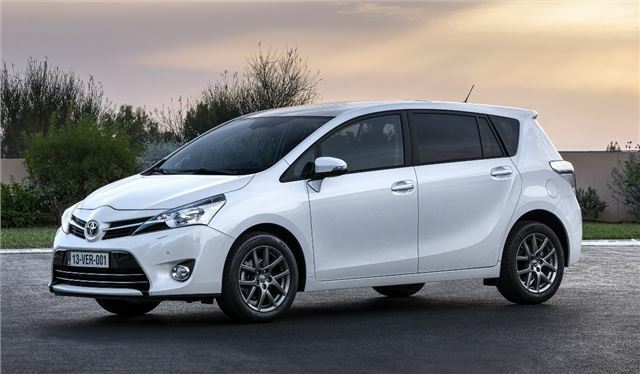 You might think the process to design an MPV like the Toyota Verso is a simple one – the designers sketch a tall, upright cabin on a long platform and then go to the pub while executives nod and sign it off for production. Unfortunately it's not that simple as the people who buy people carriers are a demanding bunch. There needs to be a blend of everything that makes a good car, but with the benefits of a vast, versatile interior. It has to drive like your everyday hatchback, but should have a raised driving position to give a good view of the road. It needs space for seven people and luggage, but can’t be too long. It has to offer flexibility, but it must be user friendly. It has to have decent performance, but it must be efficient... it’s an endless list of compromises. So, actually, the designers’ task is fairly tricky. Step in the Toyota Verso. The marketing people will have you believe it delivers the perfect blend demanded by MPV buyers – so how does it perform? Keener-eyed readers will recognise the ‘face’ of this Verso from the new Auris hatchback - but this Verso is not an all-new model, rather a heavily revised version of the old car. Happily that means all the useful features are carried over. There are seven seats, the rear five of which fold completely flat. These can be configured in any way you want, so for example, if you have a roll of carpet to get move but also have two children to carry, that’s fine. In fact, you can fold all the seats and use the car as a removal van if need be. The middle row of seats reclines and slides forward and back, plus there’s plenty of headroom so carrying adults is fine. The rearmost row is only really suited to occasional use though and although cildren will fit behind other children, they might struggle for legroom behind adults. Obviously having the rear row of seats in place affects luggage space, but Toyota has put a little compartment under the floor and, along with the small amount of space behind the seats, it's enough for a family daytrip. However, the underfloor storage is at the expense of a spare wheel - there's a can of sealant instead,. All of the seats can be folded with consummate ease. The seats in middle row have two easy to reach handles, one moves the backrest around and the other folds the seats flat – and there’s no need to remove the headrests. The handles are a little stiff, which keeps little ones from folding their siblings up on the motorway, but aren’t so stiff as to be inoperable with one hand. If you fold all of the seats down there’s a huge, flat load area of 982 litres. It’s enough to transport pieces of furniture and other bulky items. Even with the car in five-seat form there’s a sizeable 440 litre load area, more than enough for weekend away or a family load of shopping. The cabin of the new Verso is remarkably hushed and refined. It rides smoothly and comfortably over speed bumps and potholes and there’s little intrusion from wind or road noise – it’s an area Toyota spent considerable effort on, revising the shape of the wing mirrors and increasing the amount of sound proofing. Unfortunately, while the cabin may be comfortable and quiet, it lags behind European rivals when it comes to finish. Everything is perfectly solid and feels hardwearing, but the plastics, storage area linings and door pockets aren’t as plush as they are in cars like the Volkswagen Touran or Ford C-MAX. That said, Toyota has spent money on improving the interior. There’s Nappa leather on the steering wheel and a soft touch dashboard covering. Of the components changed in this Verso, 60% are cosmetic while the remaining 40% are under the skin. Significant improvements have been made to the 2.0 D-4D diesel and Toyota is also offering a 1.6-litre petrol manual and a 1.8-litre petrol with a CVT automatic. Toyota expects the 124PS 2.0 D-4D to be the big seller in the UK and it's easy to see why. It’s a very impressive engine with 310Nm of torque available from very low down the rev range, giving plenty of performance no matter what gear you’re in. On top of that it’s very smooth and quiet, plus thanks to some technical improvements it’s cleaner than the old engine, with emissions of 129g/km and official fuel economy of 57.6mpg. 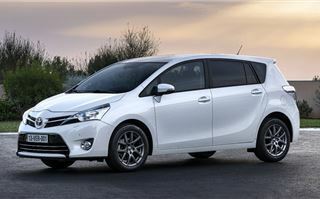 It’s not just the engine that impresses – the Verso is a very easy car to drive. The steering is light at low speed, making manoeuvring simple and the suspension, while soft and quiet over broken surfaces, does a good job of keeping body roll at bay when cornering. It's safe, stable and predictable. If there are any criticisms they’re minor - the steering could be a little heavier at higher speeds and the front window pillar is obstructive. Toyota has made the decision to bring a five-seat model to the UK, but expects it will only account for a handful of sales. The seven-seater will be the default for most people with the mid-spec Icon trim being the most popular choice. It’s well equipped, with 16 inch alloy wheels, dual zone climate control, a reversing camera and a touchscreen entertainment system. The new Verso might not be a ground-up replacement, but the sharper exterior styling and enhanced refinement add up to make it a convincing package for demanding MPV buyers. If you can get over a few slightly suspect interior trim materials then all of the ingredients are there – it’s practical, comfortable, easy to drive and it should - if Toyota’s reputation is anything to go by - prove to be reliable and economical.